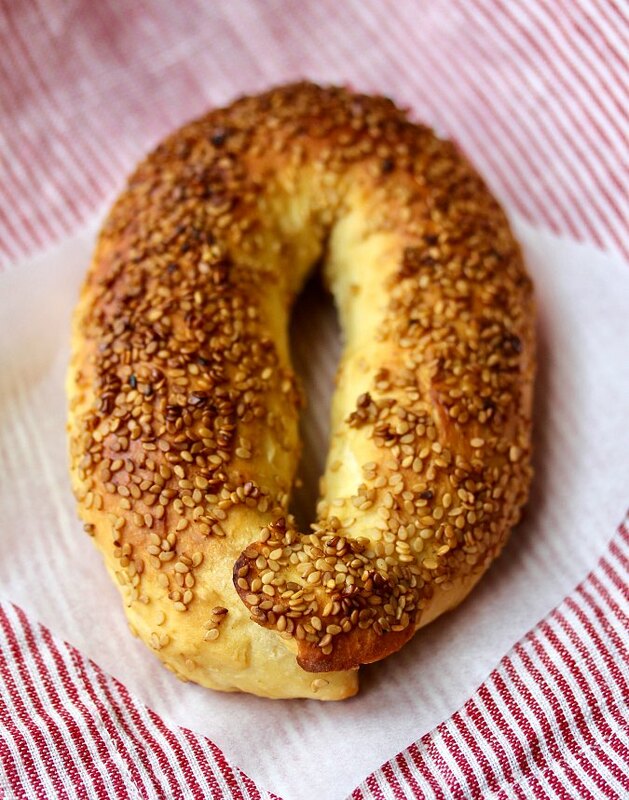 These bagels are coated in sesame seeds that are mixed with pomegranate or grape molasses. I used pomegranate molasses, which I found in a local Middle Eastern market. If you can't find it, you can make your own by following the recipe for the pomegranate reduction in this post. You could also just egg wash the bagels before dredging them in sesame seeds. You'll get the sesame seed flavor, but not the tart pomegranate flavor. This bread is pretty amazing straight out of the oven. How often have you cursed a bread recipe that has said "cool completely on a wire rack?" This bread is amazing straight from the oven, no holds barred, no cooling required. In fact, if you have any leftovers, freeze them to maintain freshness, and then toast or warm them in the oven or microwave before eating. This recipe is adapted from the amazing book, The Palestinian Table by Reem Kassis. This month, the Bread Bakers group is baking Middle Eastern breads. 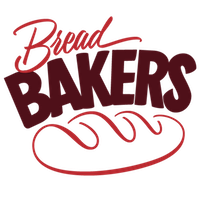 After the recipe, be sure to check out the amazing collection of breads. Add the flour, sugar, salt, milk, yeast, and baking powder in the bowl of a stand mixer with the dough hook. Mix on medium for two minutes. Lightly coat a bowl with olive oil and transfer the dough to the bowl and turn it to coat. Cover and let rise until doubled, about an hour. In the meantime, mix the sesame coating ingredients in a shallow pan large enough to dip the shaped bagels. Set aside. Deflate the risen dough, and turn it out onto your work surface. Divide the dough into 6 equal pieces. Roll each piece into a 12 inch or longer log. Form each piece of the dough into an oval ring, about 6 inches in length. Place each oval onto a parchment lined baking sheet, and let rise for 15 minutes, covered with oiled plastic wrap. Take each oval and press the tops into the sesame seed mixture. Place them back onto the baking sheet, seeded side up. Let rest for another 10 minutes. 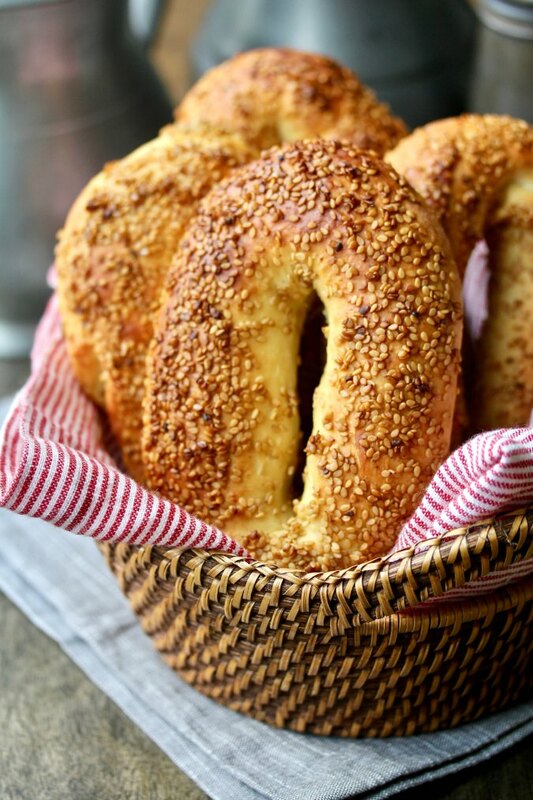 Bake the bagels in the oven until they are a deep golden brown, for about 15 to 18 minutes. Serve warm with butter, a spread, or a dip. Such delicious bread Karen. Golden and studded with sesame seeds that seem to be toasted beautifully. Love the shape. Sesame seeds in pomegranate molasses sound interesting. It really is! Thanks! The pomegranate adds a unique flavor. These golden baked beauties are looking absolutely amazing Karen. I just received a bottle of pomegranate molasses as a gift so I'm excited that you shared a recipe using it. Simply love the colour of the Jerusalem Bagels. Love the shape and its nothing like the original bagels. These ones seem much easier to make. Oh I love the idea of enjoying some fresh bagels with an interesting twist! I've never tasted pomegranate molasses on a bagel and I hope to try your recipe soon! Thanks for the lovely theme Karen! Another beauty! Having made the ka'kat I would love to try these too... and the list keeps growing and growing..
Those bagels look absolutely PERFECT. I wish I could take one right off the screen :-):-) Thank you for hosting this month with this wonderful theme -- loved baking my Middle Eastern bread and now have quite a few of below Bread Bakers recipes bookmarked to try soon. Thanks Pavani. I know what you mean! I want to bake every single one of the breads in the list. Another proof that you're a pro baker and should have a bakery of your own:):) Awesome bagel Karen! One small question; you mention that after the 2nd rise (before baking them), you dip them into the solution with the sesame. Is the dough firm enough so they won't lose their shape by handling them this way? Or should we brush them with the sesame solution? The dough is pretty firm, so there is no worries about it losing its shape. By dipping them, you get lots of sesame seeds on them, which is the goal. Thanks! That's a great story! I'm so sorry you had to miss out! 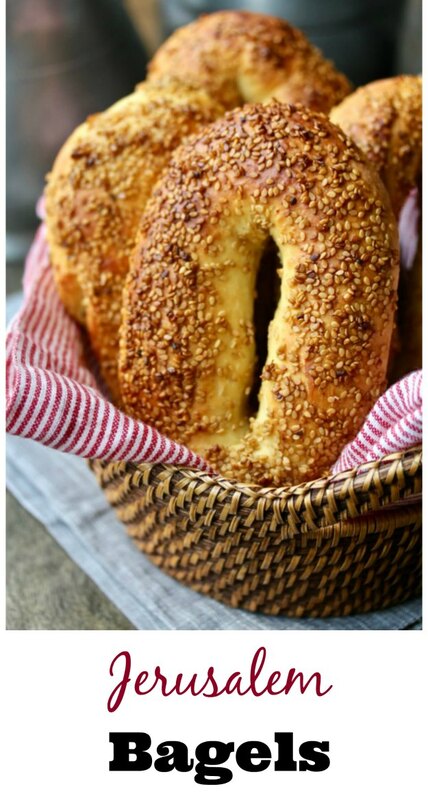 Love the shape of these bagels they look so stunning can't wait to try them. Beautiful breads but does a Jerusalem Bagel traditionally contain milk? As far as I know, yes. Every recipe I've seen for these does contain milk. It's not really a bagel, but a bagel in name only.